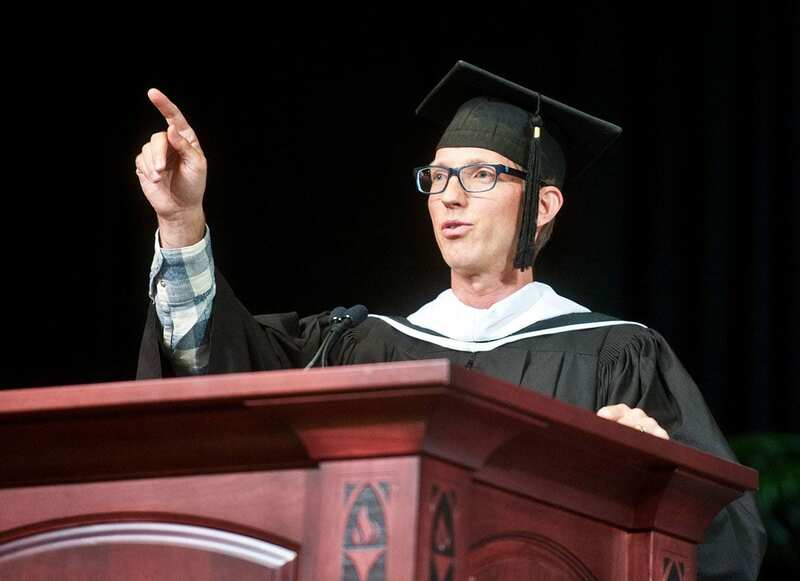 “Spare Parts” author Joshua Davis advised students to “push yourself into something uncomfortable” in his convocation address. 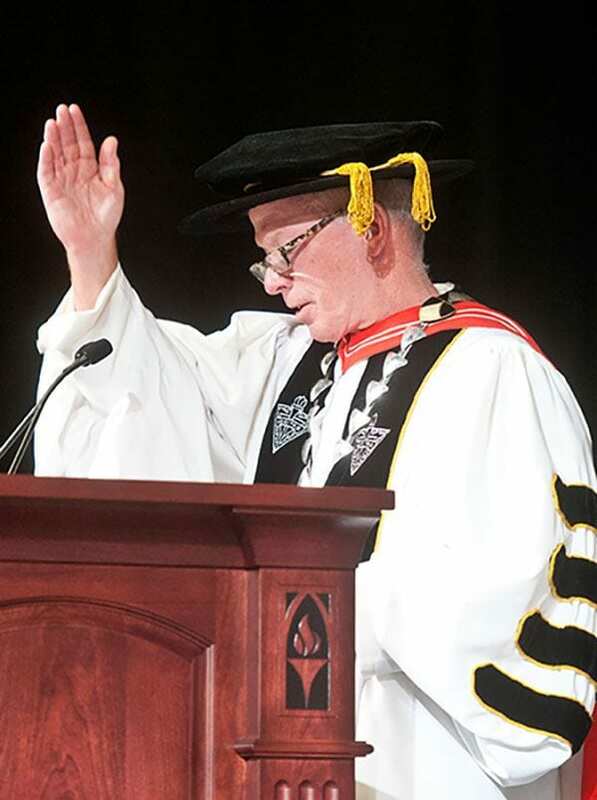 The willingness to be open to new ideas and experiences was the theme of this year’s Academic Convocation, the official start of the 2017-18 academic year at Providence College. President Rev. Brian J. Shanley, O.P. ’80 blesses the College pins given to the Class of 2021. 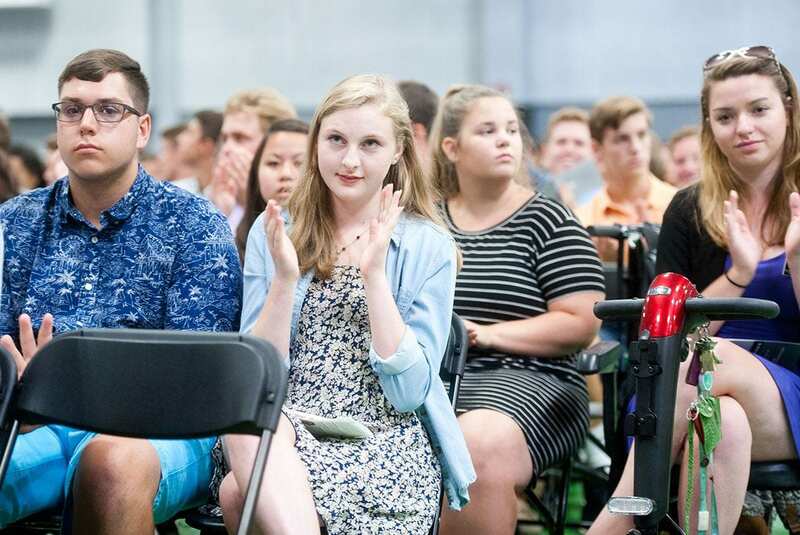 The keynote speaker was Joshua Davis, the author of Spare Parts: Four Undocumented Teenagers, One Ugly Robot, and the Battle for the American Dream (Farrar, Straus and Giroux, 2014), the Common Reading Program selection for the new academic year. First-year and transfer students read the book during the summer and discussed it during New Student Orientation before the start of classes. College President Rev. Brian J. Shanley, O.P. ’80 welcomed new students and faculty in the Peterson Recreation Center. He said he appreciated how the high school students and their teachers functioned as a team in Spare Parts, and how active the students were in their own learning. Their teachers challenged them to find answers on their own, Father Shanley said. “One of the things you learn from reading the book is that education is fundamentally a collaborative endeavor,” Father Shanley said. “My hope for you is that you imitate those four young men in your four years here. That you become active learners. That you take the responsibility for your learning. You are not here to be spoon-fed anything. You are here to learn how to learn. In his address, Davis, a writer, film producer, contributing editor to Wired magazine, and co-founder of Epic magazine, discussed his unusual career trajectory. He was a liberal arts major who studied economics and modern thought/literature at Stanford University. After graduation, working in a data entry job in his native San Francisco to pay the bills, he saw a flyer advertising the national arm-wrestling competition in Nevada, and on a whim, decided to attend as a spectator. Class of 2021 students applaud remarks by convocation speaker Joshua Davis. Once he arrived, the organizers encouraged him to pay the $20 entry fee to compete, and though Davis lost both matches — he had never competed before — it was good enough for fourth place and membership as an alternate on the national team. When two team members couldn’t make the world games in Poland, Davis went instead. He did not win a match there, either, but was recorded as 17th best in the world in his lightweight division. “Just by showing up, making that decision to have an experience outside of what was normal for me, changed everything for me,” Davis said. Back in San Francisco, Davis described his experience to a neighbor, who was the executive editor of Wired and suggested that Davis write about it. After Davis’ article was written, and published in Maxim, the war in Iraq was beginning. Davis proposed that he travel to Iraq to write for Wired, and did. “That almost impulsive decision to respond to that flyer I saw led me to this career that I didn’t at all plan,” said Davis. Dr. Eric C. Melley, a new full-time faculty member in music, directs the PC Symphonic Winds ensemble. The high school students he wrote about in Spare Parts also took a leap when they decided to travel from Phoenix to Santa Barbara to participate in a national robotics competition. Born in Mexico, some lacked documentation to be in the United States. They risked being discovered, detained, and deported to a country that was foreign to them, but went anyway because they were so passionate about their creation. “The story of Spare Parts, of these students, and the story of how I came to it, is all kind of tied together around this idea of trying to push yourself into something that maybe is little uncomfortable for you, something you don’t think you should be able to do, whether that’s arm- wrestling or building a robot, or whatever that may be for you,” Davis said. 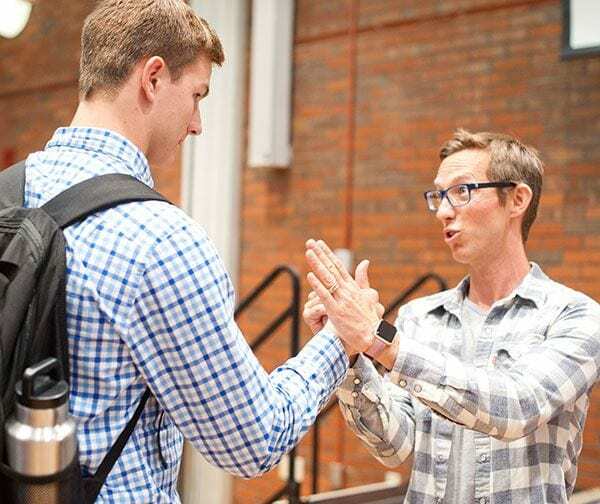 Joshua Davis, who referenced his venture into arm-wrestling in his convocation address, helps a student with a technique during the Q&A reception after the ceremony. After convocation, Davis signed books, answered questions, and even shared arm-wrestling tips with students, faculty, and staff in Slavin Center ’64 Hall. He was asked about the writing process, his work at Epic magazine, how to improve education in elementary and secondary schools, and the effect the political climate may have on immigration. The discussion was facilitated by Charles J. Haberle, assistant vice president for academic affairs, academic facilities, and technology planning, and chair of the Common Reading Program Steering Committee. Diana Iglesias ’21 (Cranston, R.I.) posed for a photo with Davis after having him sign her copy of Spare Parts. She said she could relate to the book because her family is of Mexican heritage and she once attended a mostly white school in North Carolina. “The book intrigued me. It was very, very inspiring,” she said. Davis took time to speak with each student individually, including Chip Schroder ’21 (Reading, Pa.). “It’s a cool experience. I’ve been reading his book, and now I get to meet the guy who wrote it,” said Schroder. 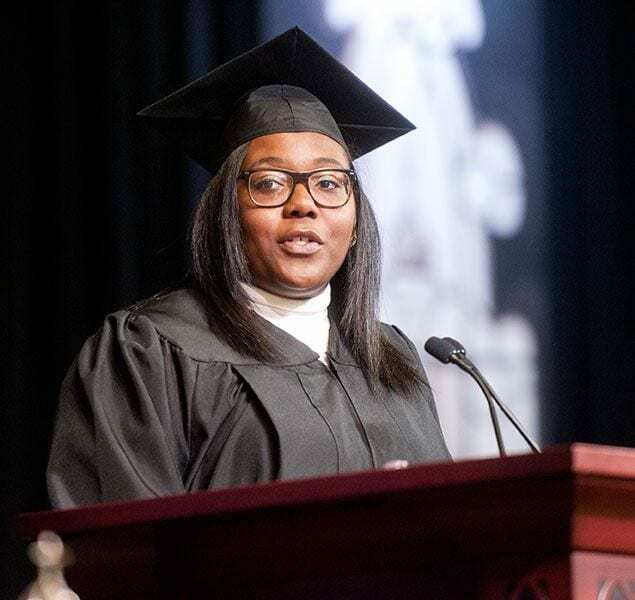 Phionna-Cayola Claude ’18, Student Congress president, encouraged professors to be learners and students to be educators during her remarks. Also during convocation, Phionna-Cayola Claude ’18 (Dedham, Mass. ), who is Haitian-American, received prolonged applause when she was introduced as the first black woman to be elected president of PC’s Student Congress. Claude is a psychology major and French minor, a head resident assistant, and founder of Believers of Words, a new club exploring the power of the spoken word. Claude welcomed students and faculty to the new academic year and reminded them that education is a team effort composed of educators and learners, sometimes in interchangeable roles. At any point, any one of them may be called upon to learn something, or to teach something to those around them, she said. Dr. Hugh F. Lena, provost and senior vice president for academic affairs, introduced new full-time faculty and recognized the teaching award recipients, who were honored that evening at the Faculty Recognition Dinner. Rev. Michael M. Weibley, O.P., a newly ordained Dominican who is now an assistant chaplain, gave the invocation, while College Chaplain Rev. Peter Martyr Yungwirth, O.P. gave the benediction. 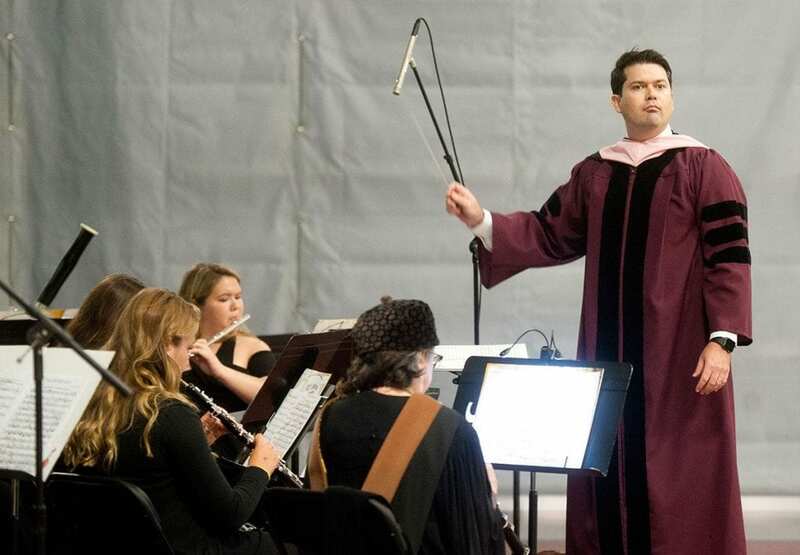 Music was provided by the Liturgical Choir and Schola Cantorum, conducted by Mark E. Colozzi, director of liturgical music, and by Providence College Symphonic Winds, directed by Dr. Eric C. Melley, a new assistant professor of music. Tiernan E. Chase ’18 (Newport, R.I.) sang The National Anthem, and Thomas Begley ’18 (St. Albans, Vt.) sang the Alma Mater.